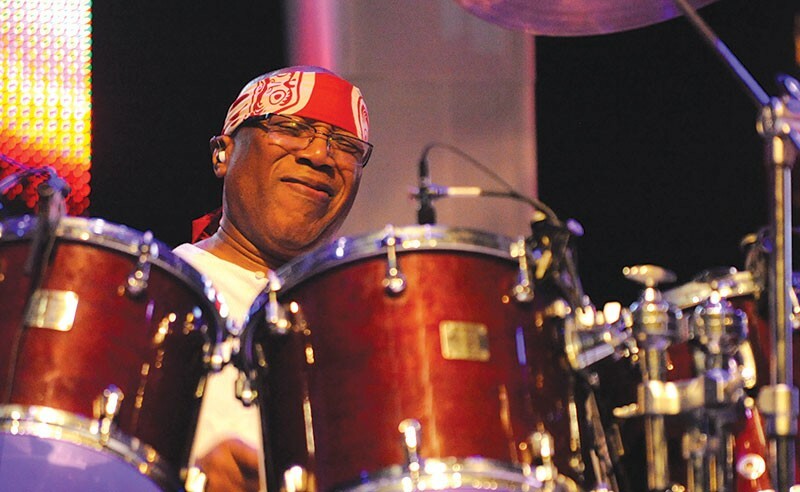 Billy Cobham's Spectrum 40 band makes its only California appearance at the Uptown Theatre on Friday, Sept. 27. 1350 Third St., Napa. 8pm. $30. 707.259.0123. BEAT REPEAT Originally, Billy Cobham didn't believe 'Spectrum' even charted. Jazz fusion is experienced on many levels. There's the Van Halen level (it just plain rocks, and is met with a scrunched "Oh yeah" face), the Rush level (technical ability drops jaws and bulges eyes) and the John Coltrane level (arrangements and chord progressions so out-of-this-world they warrant an aural double take). Billy Cobham's 1973 fusion masterpiece, Spectrum, hits on all of these, and adds a groove. The result is an album full of odd time signatures, ripping guitar solos and impressionistic synthesizer sounds with some of the most powerful, technical and musically grounded drumming ever heard. The album's best song, "Stratus," features a solid drum groove until the end, when Cobham cuts loose with insane fills in perfect time for what seems like an eternity—and, since the song fades out, it might have been quite longer. The funny thing is that Cobham, who comes to Napa's Uptown Theatre on Sept. 27, didn't set out to make a record like that in the slightest. "I made that record so that I could hand it out to suitors close to New York City, where I was living at the time, to try to get a gig on the weekends, like a wedding or whatever," says the celebrated drummer via phone from Florida, the night before kicking off Spectrum's 40th anniversary tour. When people told him it had made the Billboard charts, he didn't believe them. After all, when Spectrum was released (recorded on a $30,000 budget, start to finish) the No. 1 song in the country belonged to Cher—and, not long after, the Carpenters. So how did an album that was so far out there become one of the most celebrated and critically acclaimed fusion releases of all time? "People saw there was a possibility to combine the complex with the banal, to some degree, and come up with something very positive," says Cobham. It was, perhaps, the shock of simplicity in a genre known for complexity that took hold of listeners. Cobham, whose intricate, powerhouse drumming propelled the chaotic world of the Mahavishnu Orchestra, lays down tight grooves on Spectrum, but the album also shows off his fierce chops with numerous drum solos. It displays, as Cobham puts it, "two separate personalities in one project." Cobham has taught music in Napa through an online music school, and has visited several times, but this week's show marks his first performance in the North Bay. "I'm looking forward to this," he says. Cobham adds that his feat isn't otherworldly. "What I've done can easily be done by anyone else," he says. "People are people, and I'm just a person. We all have it in us."